I am thankful for family: The people who have always loved me, who taught me right from wrong, and who inspired in me the confidence to pursue my dreams. I am thankful for a home: A place to lay my bones and be sheltered from the elements of life. A space in which to celebrate, commiserate, and simply exist. A place with a kitchen! I am thankful for friends: New and old, near and far, virtual and in the flesh. From the soul mates who weathered storms with me to the friendly acquaintances who have brightened my days with a smile, a text, or a Tweet. I am thankful for food: Whole foods and wholesome treats born from a creative spark and a labor of love. 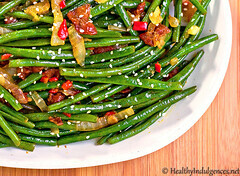 Food that fills the belly, nourishes the body, and delights the senses! I am thankful for Paleo Pecan Pie. So thankful! Yes, I made pie pictured in the photos. No, you do not have to painstakingly place the pecans atop the filling in overlapping concentric rings, cursing the day you spotted the glamorous Southern Living magazine photo that inspired your decorating scheme! Coarsely chopped pecans sprinkled atop the pie would also look lovely. With half the sugar and a gluten-free almond meal crust, this nourishing pecan pie will be pleasing to both primal eaters and junk food junkies. The sweet, slightly gooey filling has a caramel flavor due to the addition of browned butter. 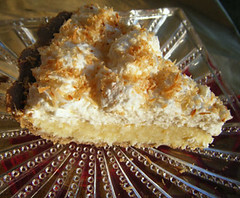 To make this pie paleo, use coconut palm sugar in place of the erythritol listed. I found the brand I use (Madhava) in the baking aisle at Wal-Mart. If you’d like to make this pie totally sugar-free, you can use Swerve . It’s a sweetener that has risen in popularity over the past couple of years, and it performs much more like sugar than any another sugar-free sweetener on the market. Swerve is made from a natural soluble fiber and erythritol, so it contains virtually zero grams of carbohydrates. You can certainly make a great pecan pie using 100% “natural” sweeteners like dates, honey, coconut sugar, and maple syrup. Please bear in mind that these sweeteners contain nearly the same amount of carbohydrates and calories as white sugar. In my experience, the aforementioned natural sweeteners can also trigger cravings for more sugary foods. You can use any crust recipe you like for this pie. 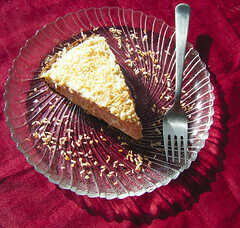 The grain-free pie crust recipe below is neutral in taste, reminiscent of a traditional pie shell. It can be rolled out and easily shaped due to the presence of xanthan gum. 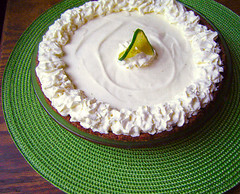 If you are avoiding starches, check out my almond flour Key Lime Pie crust recipe. 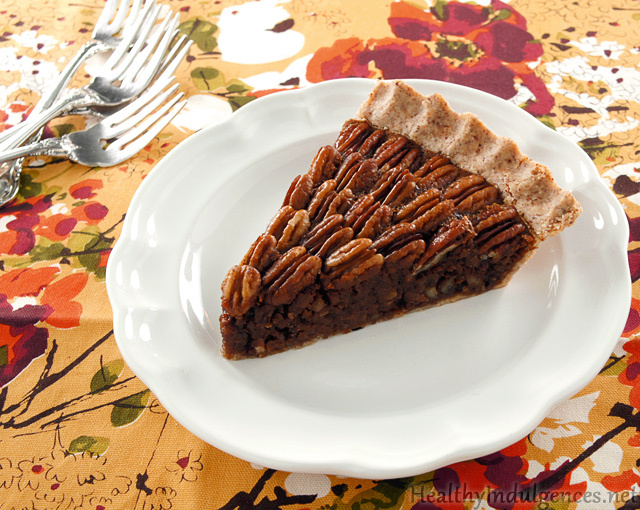 This pecan pie contains a secret ingredient in the filling: Mashed sweet potato! Just 1/3 of a cup is blended into the filling to replace the bulk of some of the missing sugar. I pinky promise that you cannot detect the taste of sweet potato in the finished pie. If you are unfamiliar with the process of browning butter, check out Jessica’s tutorial over at How Sweet Eats. It’s worth taking the time to complete this extra step, as it greatly enhances the flavor of the pie. Browning butter will also fill your kitchen with the most delicious aroma! You can replace the erythritol with an equal amount of coconut sugar if you wish. If you make this change, please consider that the pie will not be particularly low in carbohydrates. For information concerning the carbohydrate content of coconut sugar, check out Laura Dolson’s informative article over at the About.com Low Carb Diets section. A gluten-free pecan pie with half the sugar and all of the taste of the classic corn syrup-filled version. This pie contains half the carbohydrates of a typical pecan pie when made with erythritol, a non caloric natural sweetener. Brown the butter**. Set aside to cool. Chop 3/4 cup pecans, and scatter them on a cookie sheet lined with parchment paper.Toast for 6 minutes (or until fragrant) in your fully heated oven. Set aside to cool. Turn oven up to 400 degrees Fahrenheit. In a food processor or blender, add browned butter, sweet potato puree, sea salt, arrowroot starch, coconut sugar, blackstrap molasses, stevia powder, vanilla, and water. Process until smooth. Pulse in eggs, one at a time, until incorporated. Stir in 3/4 cup toasted chopped pecans. 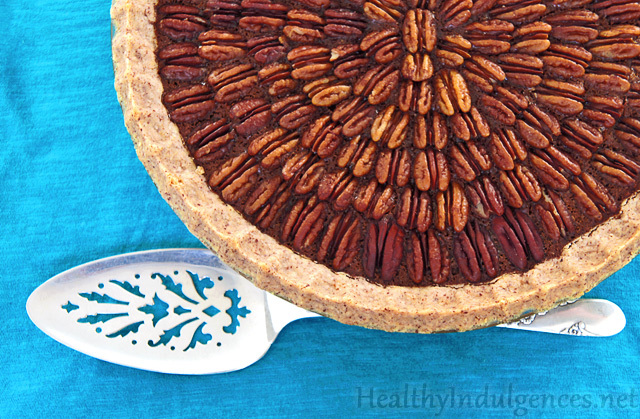 Arrange remaining 1 and 1/4 cup pecans on top of pie in overlapping, concentric circles. 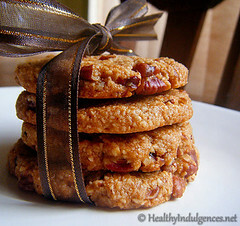 For an easier method, chop the pecans and sprinkle them over the top of the filling. Press pecans down gently until filling seeps up around the edges. Bake for 10 minutes. Turn the heat down to 325 degrees Fahrenheit. Bake 20 minutes, or until filling has just set and no longer jiggles on to the top. *You can substitute GMO-free cornstarch or tapioca starch for the arrowroot. **Follow this wonderful tutorial over at How Sweet It Is if you’re unfamiliar with the process of browning butter. Don’t be afraid to try something new. 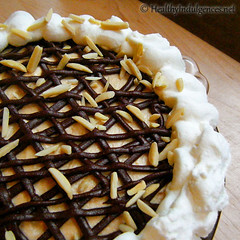 It makes a big difference in the flavor of this pie! A grain-free crust made from almond meal that you can easily roll out. The key ingredient in xanthan gum, a natural thickener that binds the dough together, imitating the presence of gluten. 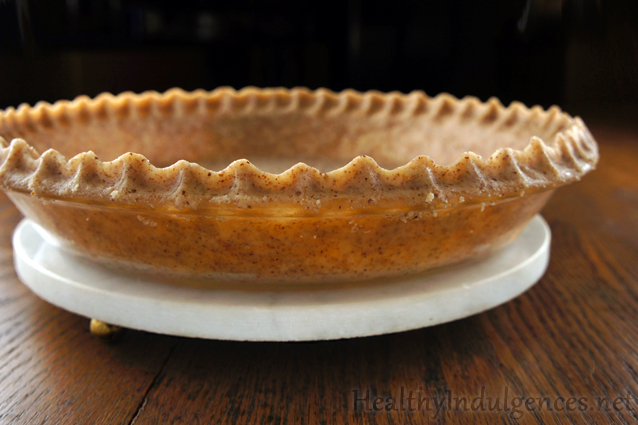 This pie crust is even suitable for lattice work! 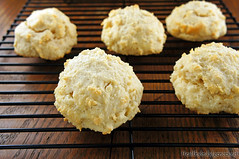 Whisk together almond flour, sea salt, baking powder, arrowroot starch, and xanthan gum, if using. Use a fork to cut chunks of butter into the dry mixture until pea-sized grains of dough appear. In a small bowl or measuring dish, whisk egg white until frothy. Add egg white to dough mixure, 1 teaspoon at a time, until you can press the dough into a ball that holds together. With homemade almond flour, I needed 2-3 teaspoons of egg white. Storebought almond flour required 4-5 teaspoons. Add just enough to form a dough that doesn’t crumble. Too much egg white will make the dough too sticky to roll out. In that case, just press the dough into your pie plate instead. If you used xanthan gum, you should be able to roll out the dough between two pieces of parchment paper. Start by making a parchment-dough-parchment sandwich. Roll the dough a couple of strokes, peel off the top sheet, replace it on the dough, and flip over the sandwich. Peel off the new top sheet, and replace it. Then, a few more strokes. Roll, peel, flip, peel, roll… repeat the process until the dough is wide enough to cover your pie plate. The idea is to keep unsticking the parchment paper from the dough so that you can cleanly lift it off the parchment and onto your pie plate. When dough has been rolled out to the right size, transfer it gently to a 9-inch glass pie dish. Set aside. 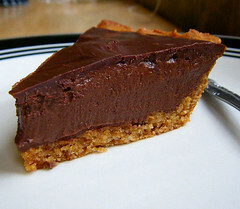 If you’re looking find a starch-free recipe, here’s my Easy Nut Crust. Craving more low carb, gluten-free Thanksgiving sides and desserts? 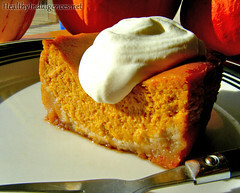 Check out the dishes my blogger friends have brought over my virtual Potluck. Your pecan pie is a thing of beauty. I’ll have to TRY it! Thank you for the nice comment! It tastes as good as it looks. Let me know how it goes for you! we made this tonight. it was a) relatively easy, b) delicious. and the crust was just amazing. it behaved like a “regular” crust. THANK YOU! Diana, I’m so glad that the pie worked out well for you. Thanks for sharing your feedback with us. What sweeteners did you use in it? hi Lauren, i used brown sugar, swerve, molasses and pure stevia powder. the only change i made was using Mexican corn starch instead of arrowroot in both the filling and the crust (on the assumption that, at least for now, GMO corn is illegal in Mexico). Thanks so much for taking the time to figure out different substitutions, so helpful! I assume I can substitute coconut oil for the browned butter. And your pie is a showpiece!! Ashley, thanks for the kind words about the pie! You most certainly can. Sub 5 Tablespoons + 1 teaspoons of coconut oil for the butter. Coconut oil contains a little bit more fat than butter. Must definitely try this one out. Looks incredibly delicious and healthy =) Thanks for sharing. Appreciate the right to talk about this in turn, I think extremely in it and furthermore take pleasure in perusing more to do with this kind of niche. If it turns out likely, during your get abilities, do you thinkings renewal all your webpage through furthermore facts? This is very ideal for me and my friends. Hey there, only became tuned in to your website through Google, and located it’s truly informative. I will be gonna look out for the city. I’ll be grateful should you continue this kind of from now on. Many people is going to be benefited from your composing. All the best! hi Lauren, for this specific recipe I just wanted to let people know that I have successfully substituted canned Pumpkin pie filling (non sweetened) and even mashed frozen cubed butternut squash – both came out beautifully. Also, I wanted to tell you that I bought your cookbook just to support the site awhile back – but that I’ve been watching your site since you first came out with the famous bean-cake. Your recipes are SO CONSISTENT – always successful. Some sites I find are very hit or miss but you must really test the heck out of them and I can’t tell you how much I’ve appreciated your time and effort. I’ve made the banana coconut flour muffins, the biscuits, pies, cookies, you name it, I’ve probably tried it. I can’t get over how good your crusts are, how AMAZING the biscuits are… really. 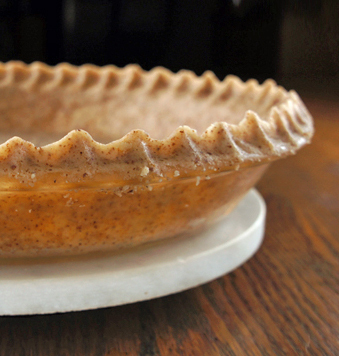 I now use your paleo pie crust for all my pies. I’ve served the chocolate cake and the pecan and the coconut cream pie to people at my medical office who can’t have sugar… AND to unsuspecting dinner guests who wouldn’t believe me when I told them what was in the desserts. Thank you so very very much for all that you do. It’s SO HARD for some of us to keep weight off or to keep numbers low and not to feel as though we are in constant denial… thank you!